Bringing home a new cat when you already have a dog can be stressful for both animals, especially when your dog has not been around cats before. Contrary to popular belief, dogs and cats can get along. With a little preparation, management, and consistency, you can have a peaceful household of both dogs and cats. Teach your dog a reliable 'leave it' cue before bringing the cat home. 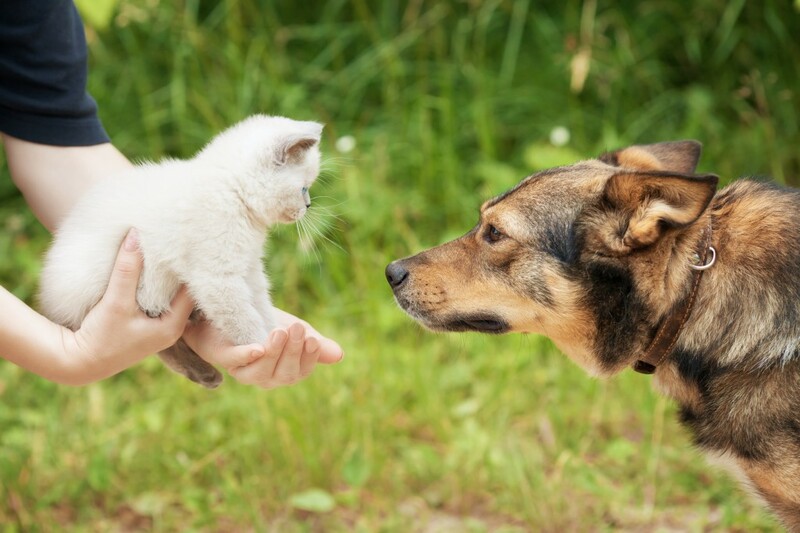 Let your cat settle into your home before introducing her to your dog. Cats usually need a few days to adjust to new surroundings. Give your new cat a safe room or area out of sight of your dog. Slow introductions are the key to long-term success. Let your dog and cat smell each other through the doorway of the cat’s safe room. If your dog is not overly excited, you can put up a baby gate in the doorway and walk him past the cat’s room several times a day. Keep your dog on leash during all initial introductions. A dog can easily injure or kill a cat, even in play. Let your cat warm up to your dog slowly. She should always have that safe space to run and hide when frightened. Cats prefer to be above the rest of the activity in the house, so try to find a high place to keep her food and litter box. Reward your dog for calm, polite behavior around the cat and immediately interrupt any chasing or barking by removing your dog from the room until he is calm. Be proactive. If you have cats or would like to have cats, do not bring home a new dog that is a breed or breed mix known for having a high prey drive. Example: Sighthounds like the greyhound and whippet are notorious for being difficult to safely integrate with cats. Always give your cats a safe, dog-free space where their food and litter box is out of the dogs’ reach. Do not de-claw your cats unless absolutely necessary and keep the sharp edges of her claws trimmed down.